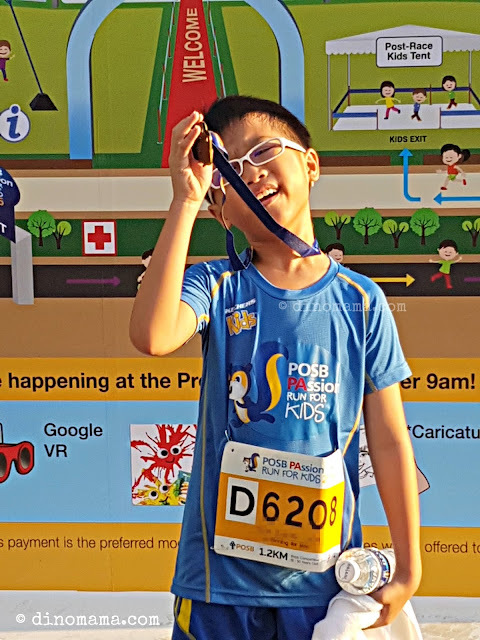 On 4th September 2016, DinoBoy joined about 7,500 other participants to run for a good cause at the 8th edition of the POSB PAssion Run for Kids. The annual charity run has raised a total S$1 million this year with strong support from corporate partners and the public to fund children’s programmes through the POSB PAssion Kids Fund, We are very proud to be part of this good cause! This run has a few Firsts for DinoBoy; it is his First solo run and his First 1.2m distance route. Looking at his time I think he did good as a first timer. You might be wondering about the POSB PAssion Kids Fund, this was established in 2011 with the aim to support meaningful and innovative community initiatives for children, the funding obtained through the annual POSB PAssion Kids Run provides for children’s programmes and activities that will benefit children up to 16 years of age in the community. Programmes funded under this Fund are designed to benefit children from different backgrounds and includes underprivileged children and special needs children as well. The programmes are created to provide all children with an equal opportunity to participate actively and pick up skills that will help them become active contributors to the community in future. 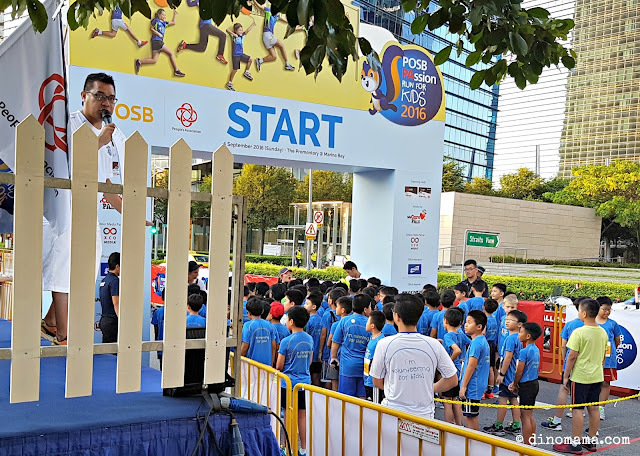 To date, the fund has supported 66 programmes organised by PA divisions, Grassroots Organisations (GROs) and Community Development Councils (CDCs) with over 244,000 children benefitting from the programmes. With funds raised annually, new programmes are continually being introduced to benefit more children. Wow isn't it! 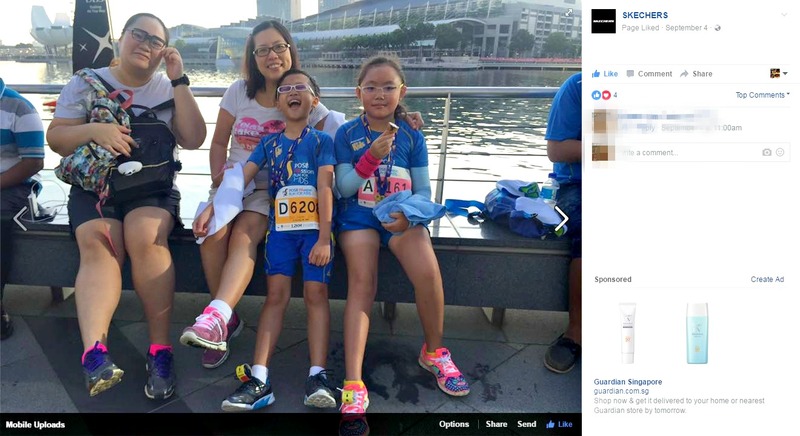 Well being one of the successful race event, I only have all the good words about it. First of all, I adore the race pack! Truth to be told, I have enough drawstring bags in the store room to let me bring a different one out each day for a week! 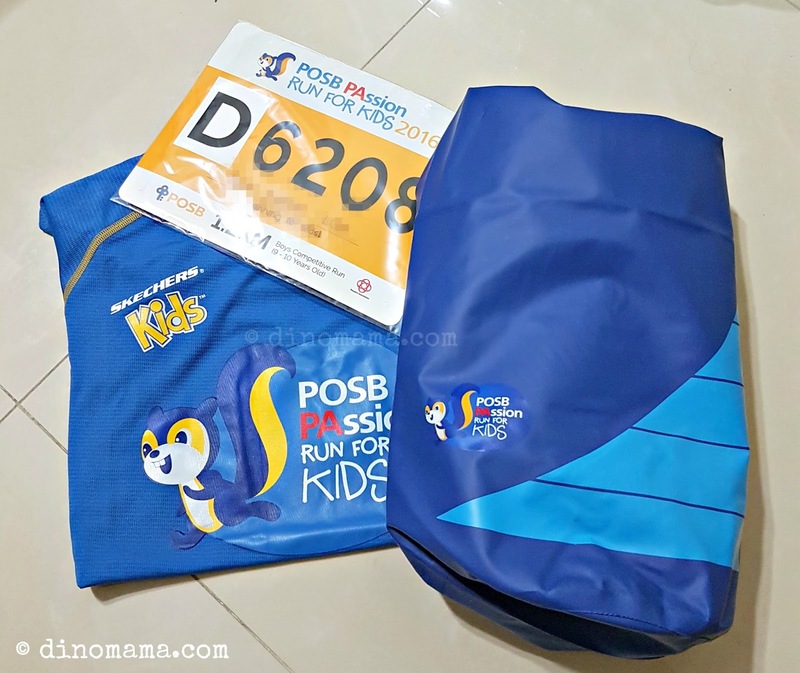 When I collected the POSB Kids Run waterproof bag my eyes were gleaming with delight! This bag is great to bring along during DinoBoy's swimming lessons or when we visit the beach. It is just the right size for him to sling across his body comfortably, no more carrying bulky and cumbersome bags! On the actual day, we were almost late because we overslept! The day before we went to Gardens by the Bay's Mid Autumn Festival till late hours, too much walking & fun makes us too tired at the end of the day. The flag off time was 7.30am and I literally jumped out of the bed at 630am, a whole one hour later than the alarm time! Lucky for us, we had transport and we flew there, reaching with only minutes to spare. We immediately led the 2 kids to the holding area, few minutes later they "checked in" to the Pre-Race Kids Tent to get ready for their race. We were told to "claim" our kids at one of then tent with a ticket that corresponds to our kids' bib number. So, where does the parents go? Well, am not sure about the others but we made our way to the starting line to try to catch a glimpse of the kids. 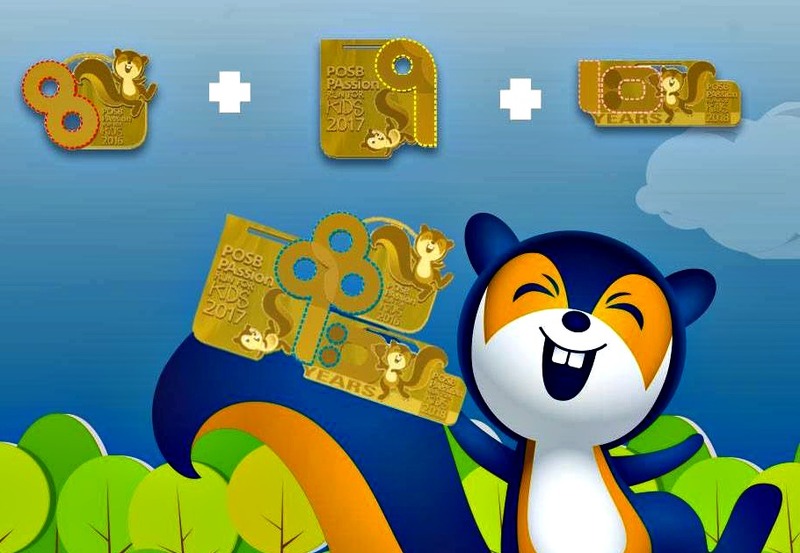 This being a kids event, a huge wave of kids participating is expected. One of my friend told me about his past experience with the run, in his exact words "POSB kids run is so congested. i see all the kiasu parents, sian already." so I was expecting chaos, havoc, messiness and many other things that are associated with huge groups of kids. Turned out that I see none of the above! 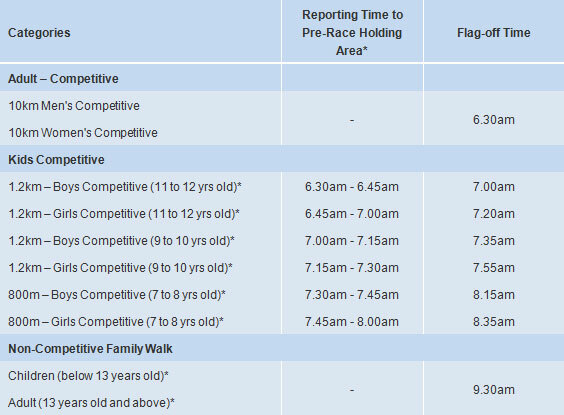 I am not sure about the other parts of the event but just on the kids racing part I think it is actually quite organised. The organisor has separate catergories for the boys and girls, each divided into age groups. 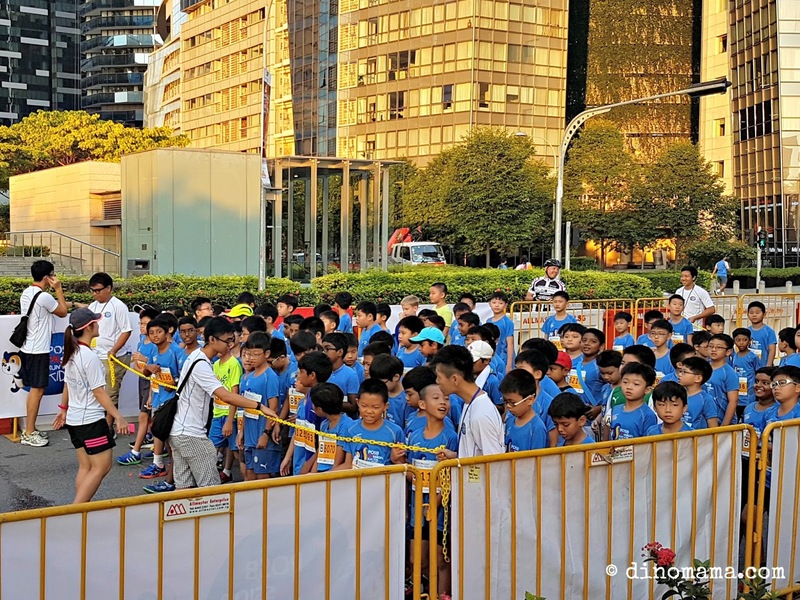 Before the start of their race, the kids were break up into smaller groups so that they can run comfortably and not have to fight running space with each other or risk getting their feet tangled thus falling down or elbow fight with each other. 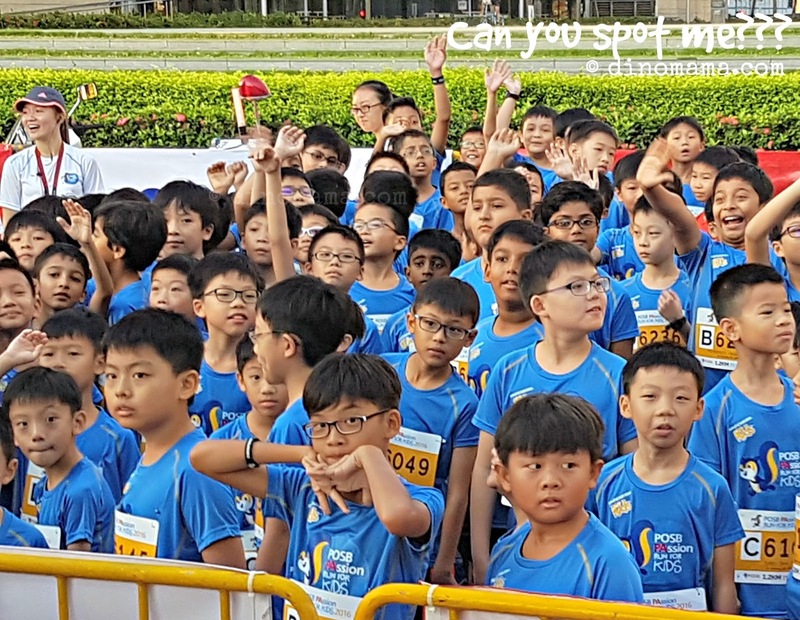 You can see the group size in the following 2 photos, the kids are chaperoned by many kor-kor and jie jie so no chance of them being lost or wander off half way while walking towards the Starting Point. 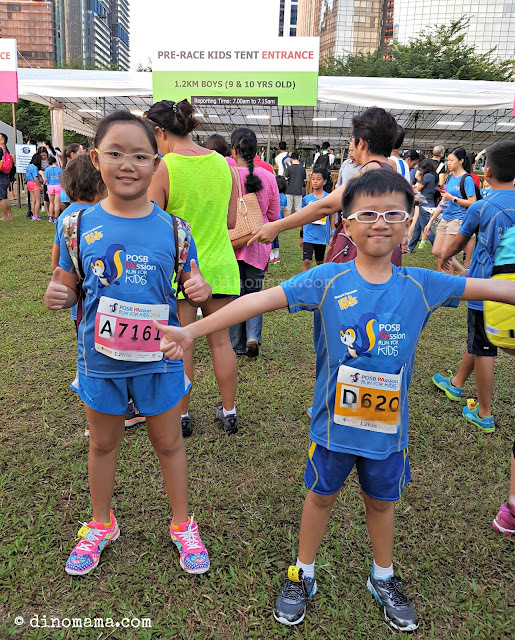 These kor-kor and jie-jie are very good, they tried to lift the younger kids' spirits, pumped their adrenaline up to get ready for the race and even cheered them on when the horn went off. Since I do not know which group DinoBoy was in, I have to screen each and every boy in the group, it does not help that he is so tiny and small built! Finally I saw him, and he really look so tiny amongst the other 9 to 10 year old boys. Don't ask me why, I don't control his diet and his appetite has always been good since young. I am clueless why he does not seems to grow in height and body mass. 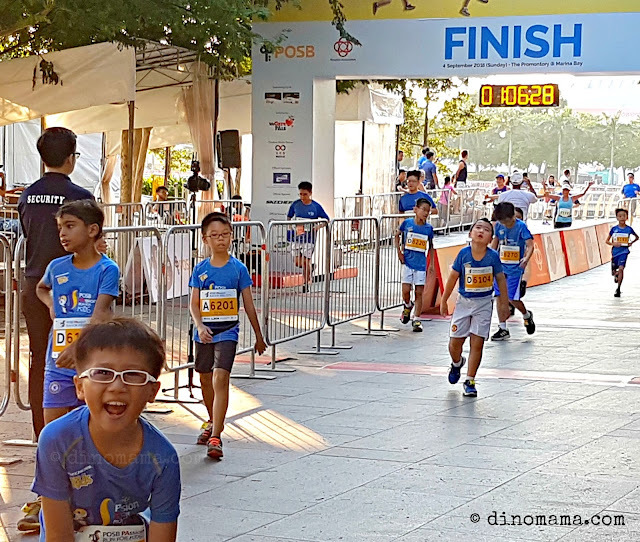 After DinoBoy and his group were flagged off, I made a mad dash to the finish line to try to catch him running through it. It felt like forever when in actual fact he took only 5mins to run the whole 1.2m. He said there were a little bit of congestion initially when every one tried to dashed to the front, forgetting the safety instructions given earlier at the starting point. Luckily no one tripped and fell or injured themselves. 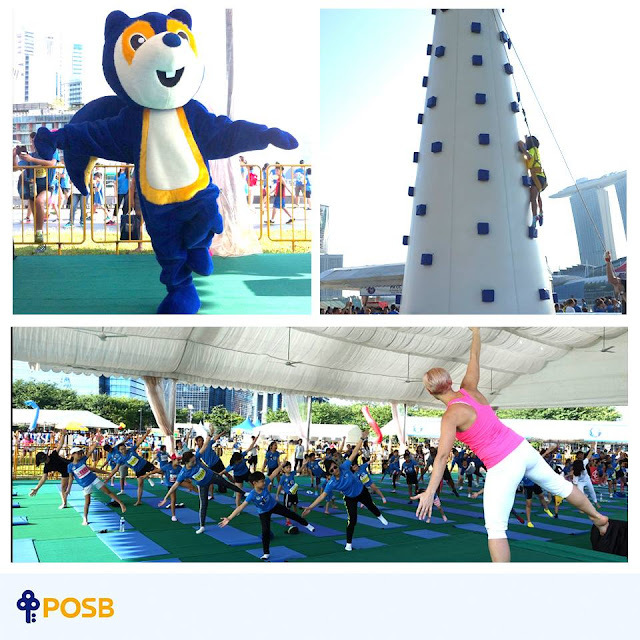 The theme for this year’s POSB PAssion Run for Kids is Wellness by the Bay. Besides the run categories, there is also the Carnival with exciting activities lined up especially for the entire family. 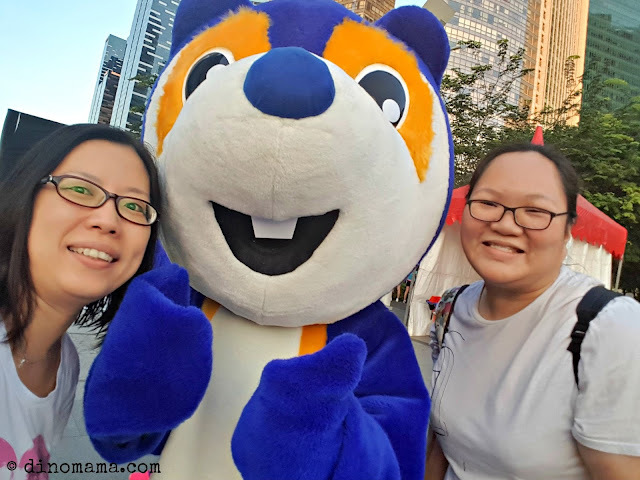 As usual we did not stay to join in the carnival because the kids were famished after the run (and a little bit grumpy coz they woke up early) we left in search of food. 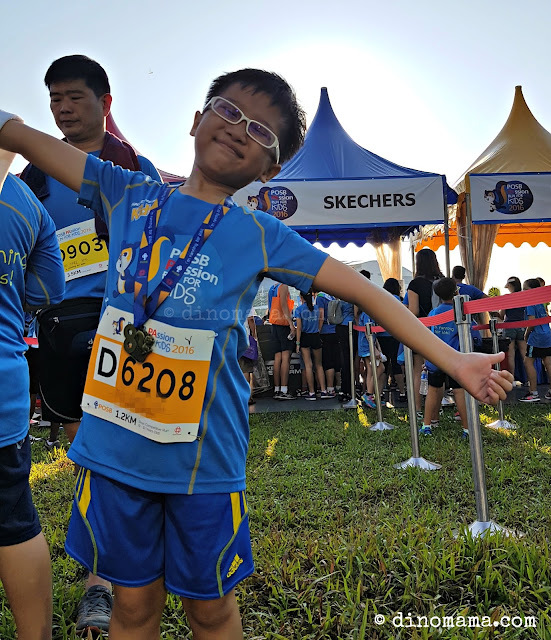 DinoBoy spotted his favourite brand - Skechers (If you have read about our reviews in the blog you would have know the reason why we adore their shoes) at the event and was so happy! They are the official apparel of POSB Kids Run 2016. We went into the tent to check out their shoes and bags, as usual it was crowded because they always have great deals during such events which you simply cannot miss it! And~~~ they spotted us too! The Skechers lady went around to spot runners in Skechers shoes and snap a photo of each of them. From their instagram post I can tell you that there are many Skechers fans out there on that day. As the event leads up to the 10th anniversary of the run in 2018 and as a Thank You to the participants for supporting the run throughout the years, a special edition of the POSB PAssion Run for Kids medal will be introduced this year. 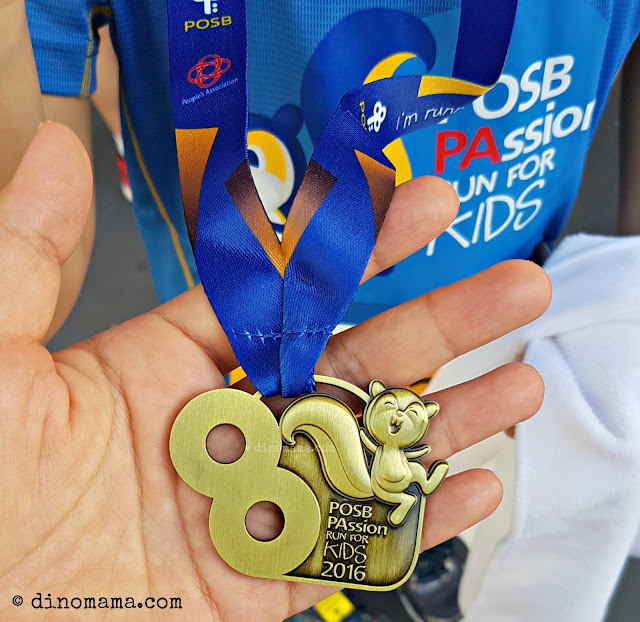 This medal can be pieced together with the medals for both editions of the runs in 2017 and 2018 to form a special edition POSB PAssion Run for Kids Medal set. This year we've got the first medal of the set, so looking forward to the next 2 years so that we can collect the whole set! How did DinoBoy feel about his first solo race? Well. I think this photo tells it all, don't you think? Savoring the taste of victory no doubt. More solo race to come my boy! SEE YOU AT NEXT YEAR'S POSB PASSION RUN FOR KIDS!